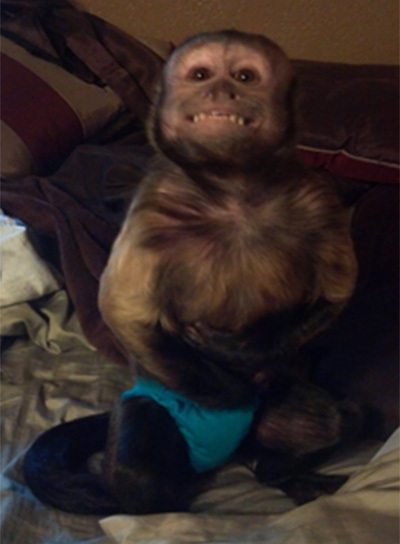 Happy New Year From Primate Care. We are excited to start 2018 with a post about monkey toys. 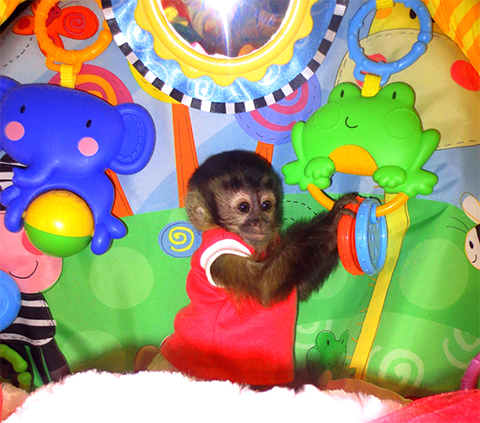 All monkeys love toys from the very beginning of their lives. In my book “Living With Monkeys”, which is for sale on our sister site primatestore.com, I wrote about helping baby monkeys to not bite by offering things for them to chew on instead of your fingers, hands and hair. Yes, even your hair can become one of their favorite play things. Monkeys love to chew on everything. When Bob and I were raising Silly Willy and he started to put his mouth on us, I knew it was time to offer him something to put his mouth on instead of us. Baby monkeys are not able to hold extremely large toys, so I went through the house and gathered things that I felt would fit into his small hands and then put small dishes full of these things into the rooms of the house that he was taken into. The things that I chose to put into the dishes were things like: plastic Bic pen tops, medium size springs, medium size washers, large paper clips, medium key rings, plastic rings that are used to hang toys on baby cribs, plastic coke bottle caps, milk bottle caps, and any other small safe things that I could find. Of course, I washed these toys frequently to ensure that they were safe for my little guy.
. I know this must be a challenging behavior as a caregiver is trying to train their baby monkey to not do this. Due to this being such a problem, the little ones will become very hard to deal with when languaging with them using the word ‘NO’ so often. 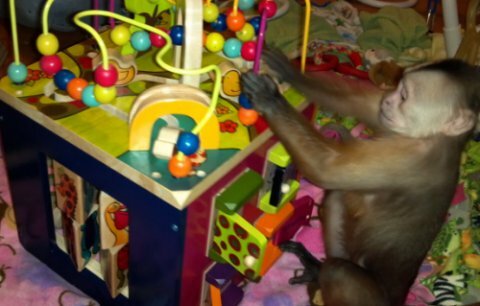 While making changes to the environment in which your primate(s) is spending most of their time at is very important to keep them intrigued, introducing new toys is just another way of preventing boredom. 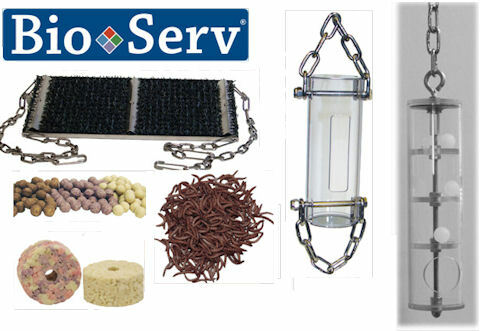 Many of the items we introduce to our capuchin are sure to keep him busy for a while and allow him to really go to town. Amongst the items we like to introduce weekly are carton boxes, magazines, or paper bags – all items that are available at no cost. Every other week we like to buy a new item to add to the collection of primate toys. One of his true favorites are plush animals which he really likes to carry around. We often shop in the baby/toddler sections of the store or for a dog toy since those are typically more sturdy toys that can handle those sharp teeth. If it is a battery operated toy, it is crucial that the battery area is secured with a screw. 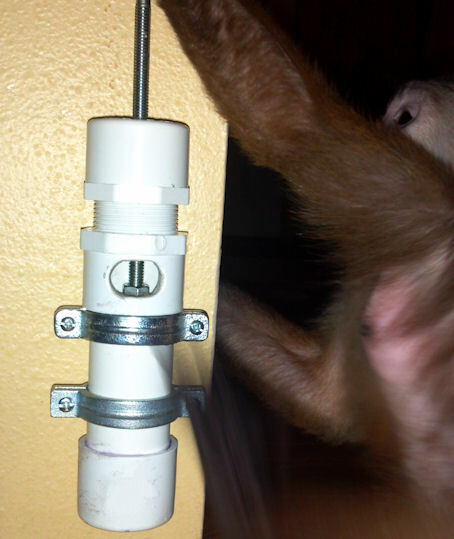 It is especially important with baby toys to keep an eye on your primate since they’re really great at taking things apart. During our last shopping trip at Target, we were once again trying to find another great enrichment toy for our monkey. More on this with several pictures after the break! You are currently browsing the archives for the monkey toys category.